It was only recently that I decided on a name for this series: Off Route 80. Before that the work done in Grapevine, West Virginia since 2006 was provisionally called New Landscapes. 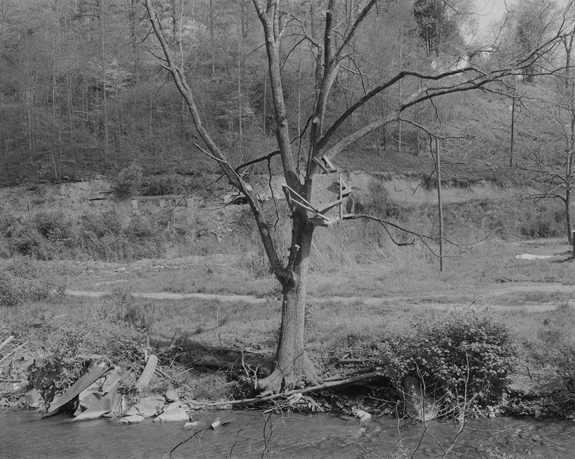 My reticence in giving the series a title stemmed from a desire to resist naming a specific place or region, in this case Appalachia — with its negative connotations dating back from before the Civil War. To do so would be declaring the work a documentary record –- which of course it is, albeit a highly-subjective one, belonging to a tradition where the artist admits to being part of the situation portrayed. My 1994 monograph Grapevine is a visual diary of the first five years I spent in the community. Grapevine is a place I have revisited now for over twenty years, much like Eugene Atget’s parks. Central to the meaning here and in most of my work is that these photographs (and videos) share the vantage point of a liberal female artist from New York City who is contemplating the bigger fiction of America. The natural versus the urban world is the arching theme here. This series also draws upon the Romantic traditions of literature and painting which highlight our place in nature. In this seemingly-bucolic setting, the intimate, formal landscapes provide a sense of place but also hint at no return. While remaining in the here-and-now, possibly as a prisoner, one sees the lush, enveloping landscape in a new way.